It’s been few months since I decided it’s time for me to leave “the ship life” and stay on land again. So far, I must say, I’m extremely happy with my decision and I’m enjoying summer as much as I can. Since I came back home I fell in love with SUP-ing (stand up paddling), so I’m still trying to stay as close to the water as possible. My friend and I decided to visit a neighboring country for few days, Austria. Since I love adventures so much, we decided to go camping by the lake. It’s been a long time since the last time I slept in a tent and I really missed it, so I was super excited about it. We found a camp right next to Wörthersee Lake. Honestly, to me it was somehow new to actually be on vacation, to have all this free time, no schedule, no rush, I forgot how that is. We used our first day there to explore Klagenfurt a little bit and to set up our camp spot. Towards the evening we went to the beach to relax and swim in the lake. And this night we were told there will be a party in the sky – one of the biggest meteor showers. So we grabbed few beers (and some rum), sat on a beach and watched the sky. Well, the sky show didn’t really reach our expectations, but there were still quite a lot of shooting stars, more than I’ve ever seen in one night. Wish upon a star they say… I had a chance to wish a lot of things that night. Cute wooden tower hidden between the trees. Cute church by the lake and Piramidenkogel tower on top of the hill. Beautiful villa by the lake – feels a bit like a fairytale. We came across two more SUP-ers, but they didn’t make as crazy distance as us. My turn to paddle! SUP adventure! Hiking through the hills and looking down on a lake. Our adventure begins! SUP time! Well I spent most of the morning on my computer, but after lunch I started my mission for the day. 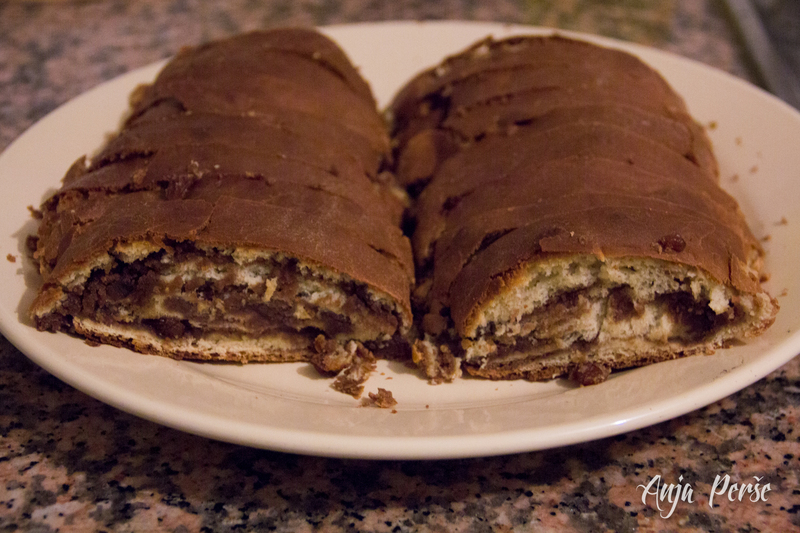 I decided to bake potica – Slovenian traditional dish. Because I’m vegan I had to find a suitable recipe. I did bake potica before, though I always had some help from my mom, but I never baked vegan potica. Well I found some recipe and I started with the filling, that wasn’t made from walnuts but with almonds, and then I started to work on dough. I had some problems with that because it was all sticky, but Damir helped me and at the end I got quite nice result. When I started to use a glass bottle as a rolling pin it worked well, but the dough became a bit sticky again, even though I put flour under it… Oh well, in the end it turned out ok, so I put the filling on flattened dough and I started to roll it. I had some sticky problems again, but I did it. We put the potica in the oven and waited. After my baking was done, Damir occupied the kitchen with his cookie mission. Not one, but I think two types of cookies were in his plan. I kept him company for most of the time. I kept on asking him if I can help him with something, but obviously he had everything under control and he insisted on doing everything by himself. Oh well, it was nice to just hang out and chat. Oh, and I have to say that today we had really beautiful cloudscape again and I just had to take some photos. The colours were amazing and so surreal! So we’re back to grey cloudy days as it seems. But it was still quite warm, though a bit windy most of the day. Well, I decided to do some laundry, because you can’t be sure about the weather here, even if you think you are… =) I was lucky and it didn’t rain today, but my clothes still didn’t totally dry until the end of the day, so I had to move them indoors. Ok, enough of these unimportant things that nobody wants to really know… Well I spent most of my day just searching over the internet for some photographers or other artists that worked in area of my final diploma project. I found some really amazing artists and maybe their work can’t help me with diploma, but the amount of inspiration I got from that was totally worth it. From all that I found, I must say these two are one of most inspiring and I recommend you to check them out. Cole Rise and Niki Feijen. After all the thinking I really needed to get out, so I went to the shop and Damir was so kind to keep me company. I’m always happy when I don’t have to go to shop by myself. I just love to have someone around to talk with. =) It looks like all of the lying in bed and waiting for my knee really paid off, since today I was already able to walk totally normal and I barely noticed any pain in my knee. I dare to say my knee is healed. =) I dare to say my knee is healed. =) Yay! So there we have it again, Portuguese weather. It just keeps on changing, few minutes of rain, then we get some sun and just when you start enjoying it there it starts to rain again. I don’t think I’ll ever get used to that. Well if I didn’t go out or do anything very productive, I at least took some photos at home. Today I was quite fascinated by the sky, but I wanted to be creative, so I took some photos of my window and reflections in it. I must say I didn’t expect that I will actually really like the result. I think photos turned out quite interesting!